Love’s Coming of Age is a book of essays published in 1913 that considers gender roles at the start of the 20th century. Carpenter contended that just and equal societies must promote women’s sexual and economic freedom. 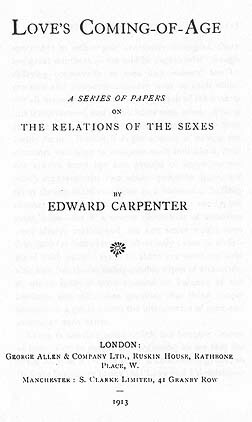 Carpenter’s analysis focuses upon the negative effects of the institution of marriage, and he offers a prescient vision of how gender roles might evolve. By the time Love’s Coming Of Age was published, Carpenter (1844-1929) had become a familiar name in radical and socialist circles. He was an advocate of the ‘simple life’ and of sexual freedom, and author most famously of the prose poem Towards Democracy.